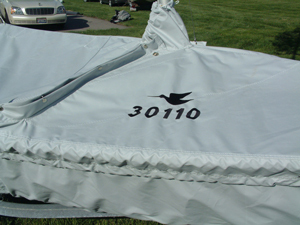 Monogram w/Symbol -- One Design Sailboat Covers -- The Sailors Tailor, Inc.
Monograms are done in a contrasting color, usually black. Although we have over 40 colors of monogramming thread, we recommend staying away from the special colors as they tend to fade and just do not hold up like black does in the sun. If you desire a specific color, please indicate that in special instructions box when ordering.